Police spokesman Dwayne Caines has confirmed that 26 year old James Lawes, a Jamaican national, has died as a result of his injuries sustained in the Friday night triple shooting. Speaking with those that knew the victim, he is described as being a “quiet type of guy”, who just “worked and hung out”. The murder victim James Lawes is the son-in-law of former UBP senator Gina Spence Farmer, and worked as a barber. The shooting took place on Fri, March 19 at around 11pm on the parking lot of Place’s Place on Court and Dundonald Street. Bernews received a report that the shooting was carried out by two men on a black bike who drove into the area, opened fire and sped back off in the Tills Hill direction. 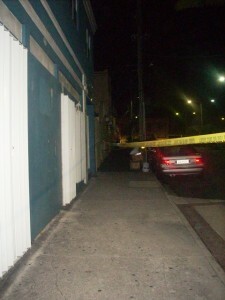 This marks the second murder of 2010, as Bermuda has already lost one person to gun violence. 34 year old father of two Perry Puckerin was fatally shot in Hamilton Parish on January 4th. Police are appealing for any witnesses or anyone with any information in this incident to contact the Serious Crime Unit on 299-8115 or the independent 24 hour confidential Crime Stoppers Bermuda hotline on 800-8477. Detective Chief Inspector Nicholas Pedro of the Serious Crime Unit is particularly interested in speaking with anyone who may have been in the area of Dundonald Street and Court Street in Pembroke around 10:55pm Friday and saw anything suspicious, no matter how insignificant it may have seemed at the time. Bernews extends our sympathies to the family and friends of the victim. Update: for full update see here.